This past week felt like summer even though the tasks were fall in nature. Typically when I think of work at the end of september/early october, I think of dunking my hands in freezing water trying to hold a brush to clean squash, but not this year. Today we were cleaning squash outside with a slight breeze in the air and a warm sun in the sky. It was nice. Also I was out pulling in the turnips this morning and it didn’t seem right that I was harvesting this crop in a t-shirt. However, it’s undoubt-ably fall because everything in the fields just doesn’t grow. Even with warm days, the loss of sunlight and shorter days really slows things down. I keep having high hopes that the carrots in the last bed will bulk up, but they just seem to sit there. There’s no issue with greens bolting too soon, however, so let’s be thankful. On Monday we had the Pelican Rapids Early Childhood classes out and it was a real blast to have that many people here. Our quarter-mile driveway was lined with cars and I had to do three groups for the haywagon ride. 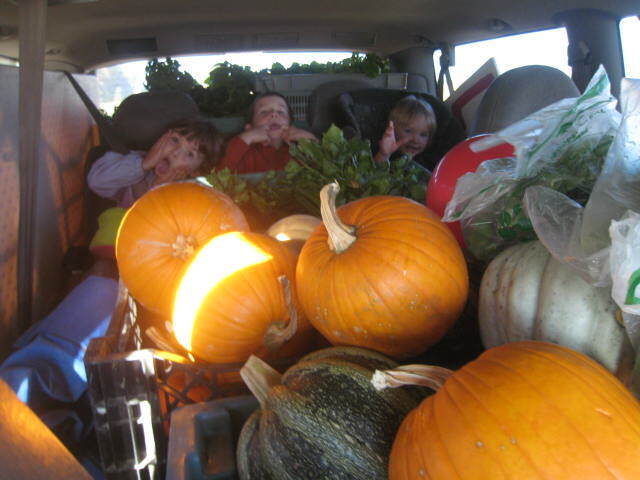 The kids got a kick out of throwing old tomatoes to the pigs, seeing the sheep and our one donkey, and finding a pumpkin to take home. I made sure to do a little ag education when taking people on the tour, pointing out how we graze our sheep in rotation and giving the lowdown on what’s alfalfa and hay vs. straw. Braising mix: this is a mix of greens you can use at the end of a stir fry or as a cooked side green. Simply start with some garlic and oil in a skillet, chop the greens, and saute until wilted a bit. Spaghetti Squash: See video below to see how to prepare as a pasta. Long Island Cheese Squash or Kakai Pumpkin: The Long Island Cheese looks like a cheese wheel and is the color of a Butternut. Mar and I really dig the flavor of this squash and Maree makes these pumpkin-cream cheese bars with them. A Kakai pumpkin is dark green and orange and is supposed to be super for pumpkin seeds.